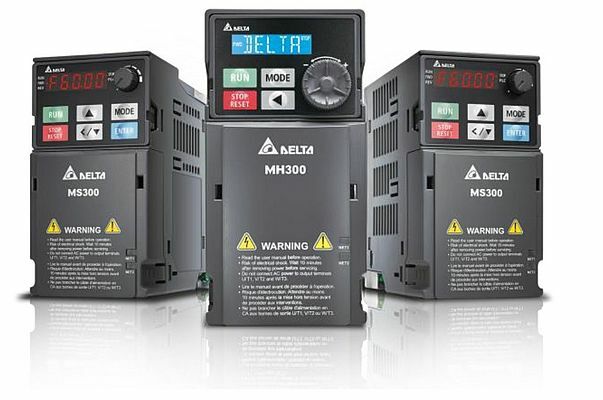 Delta Electronics releases the new M300 range of Drives for the simplest to the most advanced applications: machine tools, textile machines, woodworking machines, packaging machines, electronics manufacturing, fans, pumps, air compressors and more.The M300 range is made of 3 Series: the MH range is dedicated to advanced automation needs; the MS300 covers main applications when the ME300 has been designed to be a very affordable solution for many automation systems. The range is perfect for Delta´s integrated factory solution with EtherNet/IP communication. Its compact design, with up to 40% size reduction, provides open or closed loop control for both IM and PM motors up to 1,500 Hz. The MS300 series supports control over EtherNet/IP, E-Stop & STO safety; it also includes a fast deceleration feature with reduced regeneration energy. Delta's M300 range is a standard compact vector control drive that inherits Delta´s superior drive technology. It supports both IM and PM motor control for application flexibility and provides STO safety (SIL2/PLd). Several essential built-in functions include a PLC for simple programming tasks, a communication slot for various communication cards, and a USB port to enable fast and straightforward data upload and download. With drive size reduced by up to 40%, its space saving design helps minimize setup and wiring time, whilst providing a high efficiency and high stability system. Designed for micro variable frequency drive applications up to 22 kW, the MH300 delivers high speed up to 2000 Hz and operation for either induction motors or permanent magnet motors. Built to be highly reliable, 100% coated printed circuits boards allow these new drives to withstand dusty and harsh environments for longer periods. New PCB coating for circuit (IEC 60721-3-3 class 3C2) and thermal design applications enable a temperature range from -20 to +50⁰ C. Like its predecessors, the M300 Series benefit from Delta´s optimized high range production quality systems enabling this drive to differentiate itself both for reliability and costs. As well as impressive speed, power and compact size, these drives were specifically designed to be exceptionally user-friendly. In addition, this range is a general-purpose drive, making the entire product line easily scalable from a few watts to 22kW. The M300 offers two control methods - volts per frequency (V/Hz) and sensor-less vector control (SVC). For communications, the MS300 has a standard modbus and a single option card slot for CANopen, DeviceNet, EtherNet/IP, Modbus TCP, and Profibus-DP. The high performance MH300 series has two option card slots for increased versatility and features built-in Modbus and CANopen with the same communication option cards as M300 plus EtherCAT. The MH300 can control up to eight motors simultaneously (4 for MS300), it also features a built-in PLC (2K/5ksteps) and Safe-Torque-Off. Other standard features include energy saving modes with network expansion covering EtherNet/IP, Profibus, DeviceNet and Modbus TCP.